The Feast of the Holy Trinity was born out of the Arian controversy debating the divinity of Christ. This was resolved with the Nicene Creed and the Councils of Nicea (325) and Constantinople (381). By the early 400’s preaching and liturgical texts sought to strengthen the Church’s faith and teaching on the Trinity and the origin of this feast began. God has a covenantal spousal love which is ever faithful, particularly when the other covenant partner is not faithful. Does this change your image of God? Heal an ‘old’ image of God? Comfort you? How? 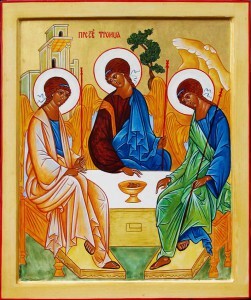 Rublev’s famous Icon of the Trinity is shown above. It has inspired many to recognise the inner union and movement of love between Father, Son and Holy Spirit. Do you notice a gap at the table ready for you to pull up a chair? What do you think this means? One interpretation is this is the invitation at the Eucharist to join in becoming one with God in Holy Communion. Reflection Questions The Feast of the Holy Trinity was born out of the Arian controversy debating the divinity of Christ. This was resolved with the Nicene Creed and the Councils of Nicea (325) and Constantinople (381). By the early 400’s preaching and liturgical texts sought to strengthen the Church’s faith and teaching on the Trinity and the origin of this feast began. “God does not prove himself; he shows himself”. God’s self-revelation (unveiling) is necessary as all human attempts to know the depths of God would be simply guessing. 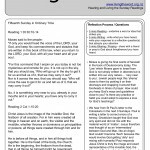 It is fitting then the first reading shares one of the great moments of God ‘revealing’ himself on Mount Sinai with Moses. Todays text is actually the fourth time Moses has gone up the mountain to speak with God.The title ‘LORD’ is a greek translation of the Hebrew YAWHEH – I AM WHO I AM – the DIVINE NAME. But God wishes to go further. ‘I am merciful and gracious, slow to anger, rich in kindness and fidelity’. The Hebrew word used to describe this character of God is found in the word ‘Hesed’. God has a covenantal spousal love which is ever faithful, particularly when the other covenant partner is not faithful. Does this change your image of God? Heal an ‘old’ image of God? Comfort you? How? The Gospel does not attempt to explore theologically the Three Divine Persons in the One God but provide us with a glimpse of the profound inner nature of Love that is God. Sometimes words and views can portray God as having to be ‘pacified’ or ‘persuaded to forgive’ by Jesus. Todays famous text completely over-rides this viewpoint. God sent and gave his Son not to condemn the world but to save the world. The motive is love. Self communication. Forgiveness. The issue now is human response. A gift can be offered. Will it be received? A response not to believe is actually a ‘self imposed judgment’. How could you help present and witness more fruitfully to your friends so they may ‘receive’ Christ? 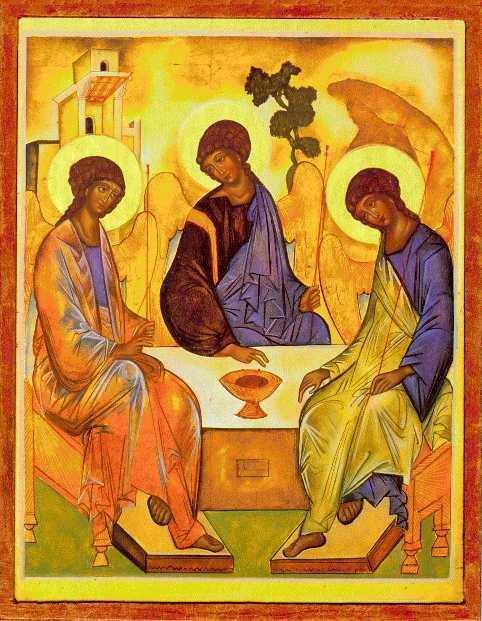 Rublev’s famous Icon of the Trinity is shown to the left. It has inspired many to recognise the inner union and movement of love between Father, Son and Holy Spirit. Do you notice a gap at the table ready for you to pull up a chair? What do you think this means?